Swing sets are common pieces of outdoor yard equipment for children. They are available in flat strap or board styles, tire swings and fully enclosed seats for smaller children. 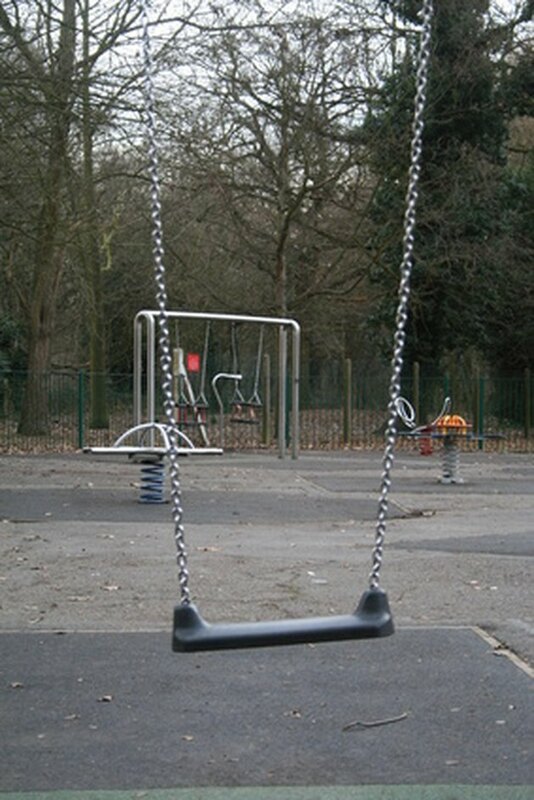 Although swings are designed for fun, they can be dangerous if proper safety procedures are neglected. One of the most important parts of setting up a swing set is determining the proper spacing for the swings. This prevents children from hitting each other and objects such as poles or trees. Proper swing spacing is important for plaground safety. Place a tape measure at the top bar of the swing set where the chain or rope of one swing is located. Measure over 8 inches to locate the proper spacing for the next swing. Continue this measuring procedure to space all forward moving swings at distances of 8 inches from each other and the poles of the swing set. Locate any lawn swings on the swing set which are swings that contain one child on each side. Place the tape measure in the center of the seat and stretch it up to 28 inches. Hold the position on one of the swings side bars and then measure outward for 12 inches, which is the closest that other swings or poles should be to this type of swing.